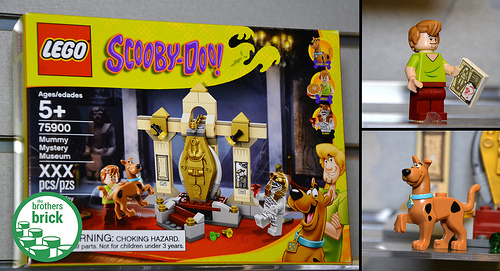 The $89.99 Mystery Mansion has six minifigs and Scooby-Doo but is missing Fred …though perhaps we’re not actually missing him, amirite? 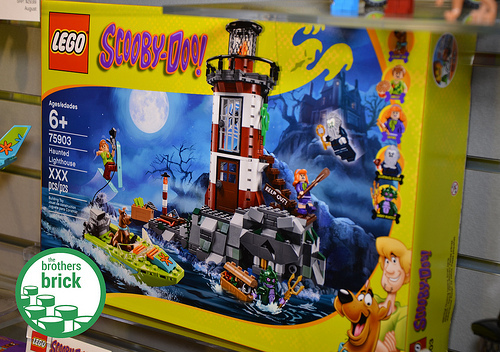 The Haunted Lighthouse is $49.99 and gives Shaggy and Daphne some alone time. Well, assuming you have Scoobs distract the two monsters for a while. 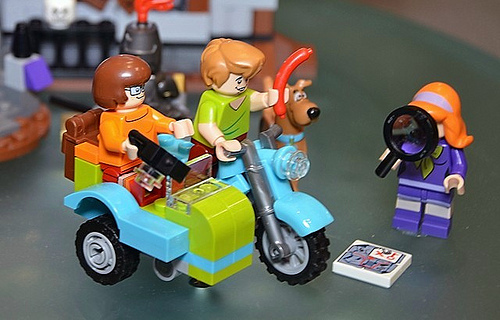 The Mystery Machine Escape has a great looking zombie, as well as a green-faced fellow to chase him, Shaggy, and Scooby (okay, that was quite a stretch for another anti-Fred joke, I can admit it). 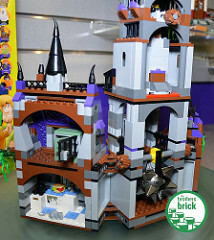 It’s $29.99 and you’ll need to buy this one and the Mystery Mansion to have the whole gang. Finally, there’s the $14.99 Mummy Museum Mystery. 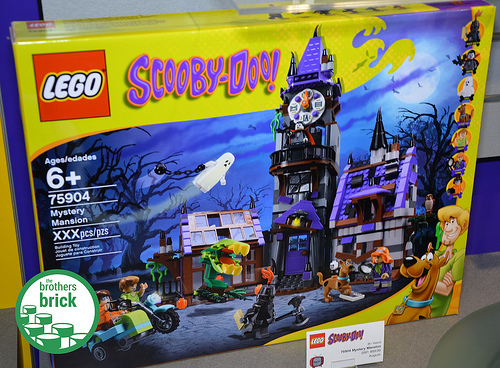 It’s the cheapest way to get Scooby-Doo and Shaggy …and that’s about all there is to say about it. 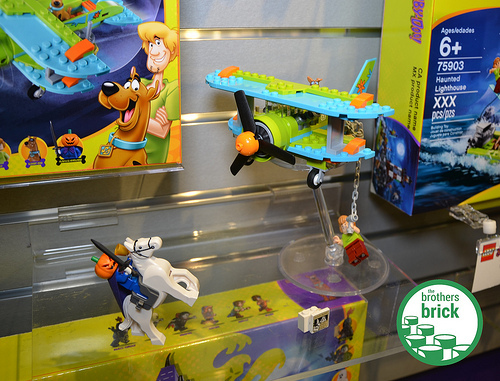 Stay tuned for more from Toy Fair 2015! Really? No need to mention that one of the paintings on the wall is a portrait of Johnny Thunder? That was the feature of the set that I was most surprised and impressed by! The sets in general are quite nicely designed, I think. I’m super excited about these, as I’ve mentioned before. Did they mention more about finding clues in the set to find out who the monster really is? Does this mean it will come with a head to switch with the monsters so you can pull off the mask of the monster? ^Aanchir – Note that the Johnny Thunder picture is dated 1922. So now we have official LEGO canon on where JT fits in the timeline. 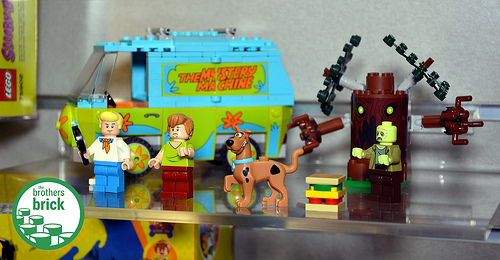 BTW, I think the tree in the set with the Mystery Machine is pretty lame. They’ve done the creepy-tree thing better before in both the Werewolf Ambush set from 2002 and the Werewolf set from 2012, not to mention the Treebeard in the Orthanc set. You’d think with the new Mixels ball joints they could do this sort of thing infinitely better now. 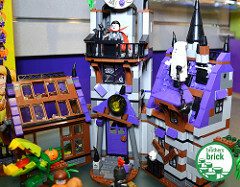 Looks like that tree can hold a minifigure, though, which is probably the whole point of it. If you watched the classic Scooby Doo cartoon, then you know that there are no actual monsters in the show — they’re all just nefarious humans dressing up AS monsters. i also thought the anti-Fred jokes were pretty good. and spot on! (Fred’s a moron, imo.) however, i would like to point out that Daphne is actually in love with Fred, who can be a little oblivious to this at times. meanwhile, Velma has a crush on Shaggy, who, between a slightly jealous Scooby and near constant hunger pangs, is decidedly NOT ready for that kind of commitment. in fairness, it’s a fairly recent development, so i can understand a little confusion over who’s paired with who.